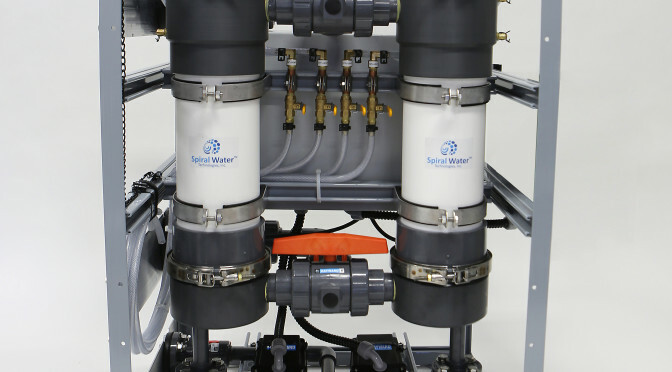 SAN FRANCISCO, Ca., October 26, 2015 – Founded in response to the growing global need for more efficient and affordable clean water solutions, Spiral Water Technologies, Inc. now offers two high solids water filtration skids with its next generation Model 810 automatic, self-cleaning filter. The FS1 and FS2 skids – with one and two Model 810 filters respectively – have been designed to address the problem of high and variable suspended solids removal found in multiple industries around the world. Delivering flows of up to either 75 or 150 gallons per minute, the FS1 and FS2 Skids remove ultra high and variable TSS of up to 25,000 mg/L, as well as oil and grease, in just one pass. Compact and modular, the FS1 and FS2 Skids include an epoxy-coated steel support frame, pipe manifolds, and programmable electronics to control filter performance and purge timing. The systems can be configured to operate on pump feed, gravity feed or pump suction. Purge valves are available in manual, electric and air actuated styles, and can be configured for high water recover or constant bypass. Market applications for the Skids encompass oil and gas produced water; industrial water; desalination; wastewater reuse and recycling; marine and ballast water; mining; power generation and hydro power; food and beverage manufacturing; biodiesel/biofuels; and pretreatment for microfiltration, ultrafiltration and reverse osmosis. About Spiral Water Technologies, Inc.: Founded in 2012, Spiral Water specializes in advanced filtration solutions for difficult-to-treat waters. The company was honored at the recent Global Water Awards in Athens, where Spiral Water won the 2015 Technology Idol, awarded to the early-stage company whose technology could change the future of the water market.